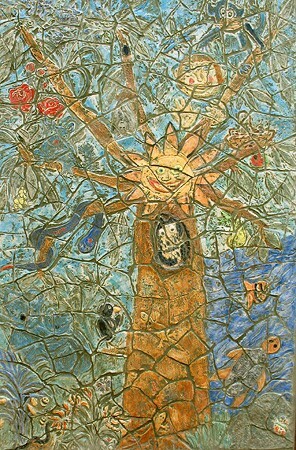 Today I attended the Good Shepherd Community House in St Albans to launch its ceramic mural project. Participants and staff turned out to view the art work for the first time and were very happy with the results. Over the course of a few months earlier in the year I ran weekly workshops in which it was created. It has now been installed in the back yard and is a wonderful colorful addition to the surrounds. At last the Arts Victoria Funded Artist in Residence at Murrumbeena Primary School I have been involved in has been launched. Along with year 3, 4, 5 and 6 student’s and Art Teacher Jenny Solomon we made a creative play space and interactive ceramic installation. The Theme was “90 Years of History” drawing on the rich and diverse history of the area including the famous art family the Boyd’s, the areas Indigenous story and that of settlement. Six sculptured totem poles covered in information and images can be explored to discover the history of the area and fabulous pictorial stepping stones weave around the poles. It’s very exciting that at last its creators can explore the completed art work and enjoy their creative endeavors. Over the weekend I was a speaker at a conference for the UNESCO Observatory: Community, Health and the Arts ‘Vital Arts-Vibrant Communities’. My talk was titled ‘Circus, art and community adds a colorful balance to life’. The focus of the talk was how art, communities and circus continue to be a wonderful source of inspiration in my life. The conference aims: To bring together people with shared interests in the arts in order to encourage activities that cross disciplinary divisions, to exchange knowledge and inspire creative partnerships. To gather credible evidence about the contribution made by the arts to community Health. To develop approaches which embed the arts within health policy and planning. The Art of Suff-Rage Vida Goldstein celebration was a great success enjoyed by all. Fern and I would like to thank all those who ventured out on a cold Melbourne day to join in the celebrations. There was a warm welcome from the Mayor of the City of Port Phillip Janet Cribbes followed by Wilma Farrow’s entertaining performance as Vida. Members of the St Kilda Historical Society filled us in on what was happening in1908 the same year women won the right to vote in Victoria. This event was supported by Gasworks Arts Park and we thank the staff for all their help and encouragement especially Crusader Hillis and Jane Chilsome. 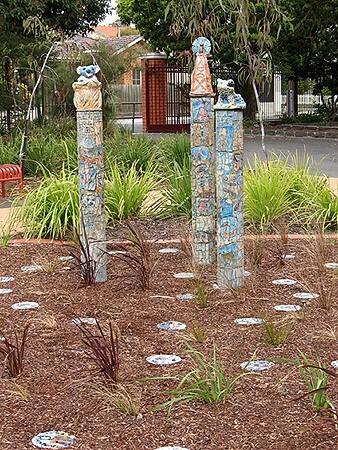 During the first term of 2008 I have been an Artist in Residence at the Murrumbeena Primary School. In conjunction with teachers and students we have been creating a sculpture installation made up of ceramic totem poles and stepping stones. The work draws inspiration from the areas interesting and diverse history from swamp to farmland, its indigenous plants and animals and the influence of the artistic Boyd family whom lived in the area for many years. Each of the totem poles was created to a theme and the students were able to research and make firstly a tile to go around the totem pole and then take part in making a ceramic sculpture to cap the piece. We have ended up with sculptures of a frog, windmill, cockatoo, and signpost a school book and a work inspired by a Merric Boyd Koala pot. This has been an exciting project for all of us involved and once again has proved to me how important it is for children to have the opportunity to play with clay. Thank you to all the Staff and student’s at Murrumbeena primary School for making me feel so welcome especially the art teacher Jenny Solomon and the Deputy Head Shirley Krongold for overseeing the project. This Artist in Schools project was funded by Arts Victoria, Victoria (The place to be) and it is a Department of Education and Arts Victoria partnership, with support from the Community Support Fund. The sculptures will be installed in the next couple of months and I will post a picture when completed. 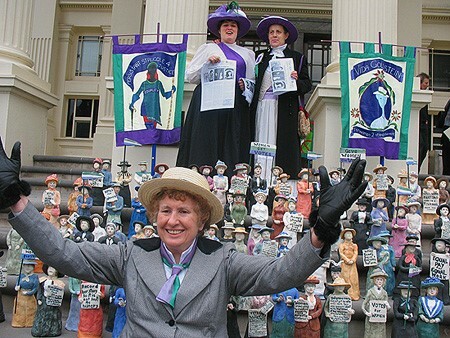 This year sees me traveling all over Victoria dressed as a Suffragist with my latest project The Age of Suff-Rage.I have been busy creating one hundred ceramic suffragists each around 30cm in height to celebrate the Centenary of Women’s Suffrage in Victoria. I have teamed up with artist Fern Smith whom is researching and painting banners and we have created a traveling art installation. The project has its own newspaper with new editions with the latest news of our travels and both Fern and I have information on our websites about the project so as you can stay informed about our latest activities. 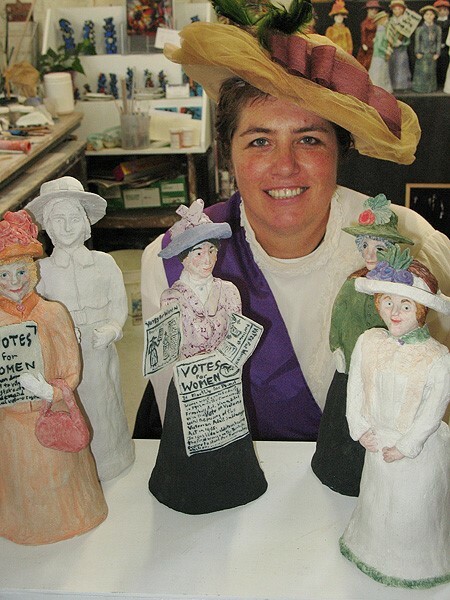 Here I am pictured with some of my Suffragists including Vida Goldstein (center) for a Media event to announce the funding at my studio in the Gasworks Arts Park. 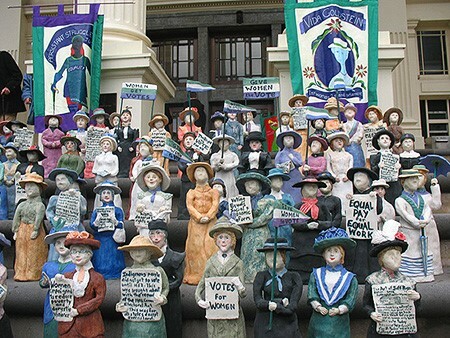 Gasworks Arts Park has auspice the project and we received funding from the Department of Planning and Community Development Grants Program -Centenary of Women’s Suffrage. Thank you to everyone who has helped to get the project up and running. In 2007 I received an email inviting me to take part in a large scale Community Art Project ( Placas de Artistas) to be held in Mexico. I have always been fascinated by Mexico’s colorful culture and at some stage I am wanting to visit the country so I jumped at the opportunity. 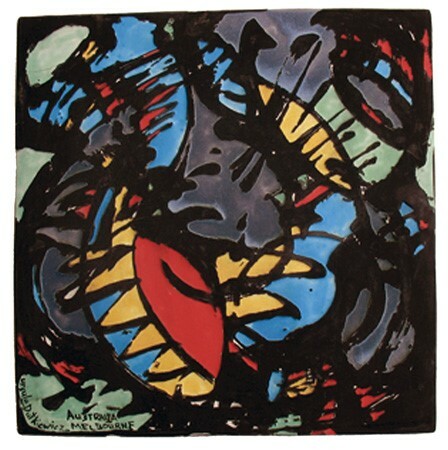 The idea was to get as many artists as possible world wide to create a ceramic tile with world peace and unity the idea behind the project. The response exceeded expectation and the launch is delayed till March 2008 to accommodate all those who responded.